A mosaic is the art of creating images, patterns or pictures using small pieces of glass, stone, glass tile, ceramic tile or other materials. 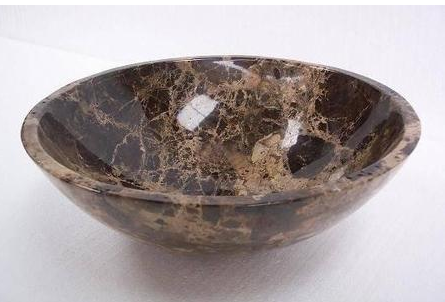 It can be used for decorative purposes and also for interior design in homes, such as creating a mosaic sink. With patience and the right materials you can make a beautiful mosaic in any bathroom sink. You can find the tiles and materials at most home improvement stores or craft stores. You may also find pieces of broken glass or tile at glass shops, pottery shops or floor covering stores. Firstly, choose the design and make an outline of it on your clean, dry sink with a permanent marker. If creating an image, follow the outline as you place the tile, otherwise you risk a scattered, random look. For a specific design, mark the color you want inside each design outline so you remember as you place the tiles. Thirdly, work your way up the sides of the sink with tiles. Fill in any crevices between the tile with exterior grout. Use a gloved hand to press the grout in place. Remove the grout residue from the tiles using warm water and a sponge. It comes off easily but may need a second pass. Apply grout sealer according to the package directions within three days of completing the grouting process.